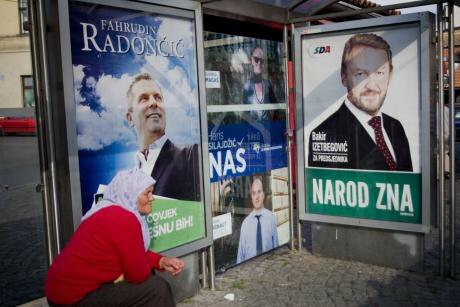 Election posters in Bosnia. Demotix/Mahir Vranac. All rights reserved. The well-known quote from “Il Gattopardo” by Sicilian author Giuseppe Tomasi di Lampedusa perfectly epitomises the current political deadlock of Bosnia-Herzegovina, right after the recent political elections of October 12. In the novel, the phrase refers to the dramatic changes expected to occur in Italy’s society after its unification in 1886. It reveals the hidden goals of southern Italian aristocracy: to reform itself through embourgeoisement and the abandonment of futile privileges, in order to retain the same social status and political influences. Interestingly, more than fifty years since its first edition, it provides a remarkable parallel with the electoral strategy adopted by the Bosnian political establishment. Moreover, it sheds light on the recent British-German proposal to support Bosnian institutional reforms by unlocking EU funds, and encouraging economic reforms through the (extra)ordinary participation of World Bank and IMF. Last February thousands of citizens took the streets to express frustration against political and economic corruption, unemployment, privatization, and the deluded expectations of economic recovery. It then appeared that a systemic change in the political leadership was needed. Since then, the uprising has quickly mellowed its radical character; now, only a very small number of plenums (direct democracy citizens’ assemblies) remains engaged with the legacy of such uprising. Allegations of infiltrations by members of political parties within these assemblies, the catastrophic floods that struck the country last May, and a general lack of faith in the responsiveness of the political establishment have contributed to the partial muffling of such voices of dissent. Very quickly, the socio-economic issues raised during the protests have been hijacked by the parties and reformulated in empty election campaign rhetoric. The victory of the three main nationalist parties has come as somehow not surprising, both to citizens as well as experts of the intricate Bosnian political situation. The international media, other than those specialised in the field, have found in the elections’ outcome a rather familiar comfort zone: there’s no need to investigate further, since ethnic politicization is clearly persisting, despite all the efforts of the international community to encourage citizens to do otherwise. Corruption and the persistence of ethnic voting have been regarded as the country’s two major problems by various international institutions and NGOs engaged in the country. The convenient obliviousness of international agencies is epitomized by the USAID campaign “Glasaj ili trpi!” (Vote or suffer); as to underline not only that the political stalemate is a responsibility of the non-voters, but implying that the most awaited change – 'if you don’t vote things will remain the same and you’ll have to live with that' – though needed, can be only achieved within the current political system. This USAID campaign thus reinforces the false promises sold during the electoral campaign: only “institutional politics will bring change”. However, the electoral results have shown slight, and yet significant, changes – often overlooked by non-specialised media. The first is the challenge posed to SNSD – “Alliance for Independent Social-democrats” and to its leader Milorad Dodik in Republika Srpska (one of the two entities of which Bosnia-Herzegovina is composed). The party, initially born as an independent opposition to the right-wing nationalist SDS (“Serb Democratic Party”), has been steadily in power since the early 2000s. The political trajectory of SNSD is well-known – from opposition to stirring nationalism; increasingly close ties with Serbia; and separatism. Its extremist calls for an independent Republika Srpska have brought the Socialist International to expel them in 2012. It is however hard to determine whether their recent narrow victory has to be attributed to the loss of support towards a very undemocratic party, to the alleged corruption of its leaders, or even to secessionists aims per se. Although feeble, this is a sign that something is moving within the entity. The decreased electoral consensus towards SNSD will in fact weaken its position not only in relation to its own political allies (DNS and SP), but within the very political structure of the entity. SNSD has in fact lost its position as member of the presidency of Bosnia-Hercegovina, thus breaking its monolithic political control over the three major institutional positions in Republika Srpska (Bosnia-Herzegovina presidency member, Republika Srpska's president and prime minister). A strengthened internal opposition within Republika Srpska's assembly could, in turn, potentially challenge SNSD's aims at depicting Republika Srpska as a strong entity ready for independence. On the other hand, a variety of commentators have stressed that in the Federation (the other entity that composes Bosnia-Herzegovina, with an intermixed Muslim-Croat population) we have witnessed a great loss of the main cross-ethnic social-democratic party (SDP), rather than a nationalist victory. In the past few years, SDP has been has been incessantly dealing with internal fragmentation, showing remarkable resemblance to European left-wing trends. One of its most successful and prominent leaders, Zelko Komsic, left the party in 2012 due to strong political disagreements, and since then has been leading a new social-democratic party (Demokratska Fronta), which, unsurprisingly, has been draining votes directly from SDP. This in turn has brought to SDP's chronic inability to properly reform and provide adequate responses to their electorate’s requests, first and foremost a more proactive policy of socio-economic development and equality. SDP has experienced a defeat because of its immobility and inability to tackle citizens’ most urgent problems. Going back to the February protests, it is no coincidence that the movement has been initiated in Tuzla, stronghold of SDP, and thus exposing its representatives to harsh criticisms from disillusioned citizens. This political stalemate, it has been argued, is the (in)direct consequence of a constitutional and electoral system which inherently privileges small parties at the parliamentary levels, and implicitly encourages path-dependency voting mechanisms. It is in fact constitutionally foreseen (through the post-war Dayton agreement) that the three national presidents, which will alternate for 8 months throughout the 4 years legislature, will be elected among the three constituent groups – Bosnjaks, Croats and Serbs. Although technically not binding, this has brought to a “national” voting tendency, in which each group votes for their own candidate for the presidency. The well-known ruling of the European Court of Human Rights in the case “Sejdic-Finci vs Bosnia-Herzegovina” has indeed found a violation of human rights in the very ineligibility of the applicants (a Jewish and Roma person) for the Presidency position - due to their non-membership in any of the three constituent nations. Although the process of reforming the constitution and electoral law has been widely discussed and supposedly set in motion, almost three years have passed without any foreseeable progress in this direction. Nevertheless, if one takes a closer look, the elephant in the room is not too difficult to find: it's the silent voice of 46% electoral abstention. Since the protests, the population’s economic conditions have, if possible, worsened: the unemployment rate is almost 44%, and hits mostly young people and skilled to highly skilled employees. Moreover, according to economic analyst Svetlana Cenic, the situation is only destined to worsen, particularly due to the absence of strategic investments and structural reforms. At the same time, corruption and bureaucratic expenditure have increased steadily and enormously throughout the years, with the country’s political elite having the highest relative salaries, in relation with the average wage. In this situation, the parties’ flaunted promises of change and vague strategies for economic progress have been rarely taken seriously.According to the political analyst Zarko Papic, these elections have “lost citizens, and have brought into power those who led us to poverty, apathy and depression”; for him, the analysis is simple: the million of people who actually voted in the elections are those who are somehow touched by the benefits of the otherwise exclusionary public sector. Here, political clientelisms are created by default, and political change is feared of igniting a domino effect of sacking-and-rehiring. Very often, the same fear is perceived within the private sector, particularly for certain key-positions that still experience political influence. Political inertia, endemic corruption and the seemingly never-ending path of Bosnia-Hercegovina towards EU accession have raised great concerns. Last Wednesday, British and German foreign ministers have put forward the proposal of unlocking EU funds to speed-up institutional reforms in the country and tackling the country's economic stagnation. In order to secure fast and effective implementation of such reforms, the IMF and World Bank will be possibly included in the encouragement of economic reforms. Internationally, it seems to be understood that no institutional reform will permanently function without a parallel economic push towards development. Although it is right in pointing the finger at the deeply rooted corruption as enemy number one of stabilization and, ultimately, europeanisation, one has not to forget where such corruption and political apathy actually come from. The post-Dayton economic system, reformed in close consultancy with international neo-liberal agencies and institutions (IMF, World Bank, USAID, EBRD just to name a few) is not designed to sustain neither economic development, nor stabilization, and not even employment. A “shock therapy” of privatization and market liberalizations has been imposed on the country shortly after the end of the war, with mass privatization through vouchers as the preferred method for a quick transfer of formerly socially owned property into private hands. The subsequent widespread selling of vouchers on the black market, at an incredibly inferior value to their nominal one – understandable in a context of extreme impoverishment – allowed those in possession of enough capital to collect a consistent number of shares and become major shareholders. The public selling of company’s shares, as a preferred method for undergoing privatization of big enterprises, has however put the country’s Privatisation Agencies in the condition of not being able to closely monitor such processes, since there is no actual mechanism of accountability for the new owners. This in turn has facilitated the dilapidation of industrial capital, slowed or prevented restructuring, and hampered possibilities of foreign investment; unemployment has increased, mass redundancies and late salaries are very frequent. Although in some cases tender privatization has brought positive results, and signs of reprisal have been timidly emerging amongst small and medium enterprises, the overall balance of the country’s socio-economic situation remains very negative. Moreover, the global economic crisis of 2008 has further exacerbated the complexity of a very weak welfare state in combination to corruption and clientelism. It is precisely in a situation of chronic uncertainty, corroborated by a myriad of examples of irresponsible management of industrial capital, that favouritism and vote exchanges come to serve a condition of social insecurity and unavoidable hopelessness. In this context, the "new" initiative brought recently brought forward by Germany and the UK shows a very superficial understanding of the issues currently affecting the country. Major economic entities such as the IMF and the World Bank have been involved in designing the country's transition for more than twenty years; the economic reforms had to be implemented quickly in order to improve citizens' standards of living. The strengthening of stable and transparent institutions, though necessary, was inevitably going to require a longer incubation period before providing any concrete results. As a consequence, the lack of balance between these two processes has so far exposed economic reforms and privatisation measures to a plethora of criticisms, entrenched corrupt elites and ultimately worsened the situation of ordinary Bosnians. Hence, the gradual loss of faith, rooted in the understanding of a political and economic system often perceived as imposed and marginalizing leads to a voting pattern in which disillusionment prevails. Those who vote wish to maintain the same power hierarchies that will ensure no earthquakes or small revolutions in their workplace; those who don’t, simply don’t foresee change as an option. It is evident that none of the major political players has the will, or the capacity, to effectively respond to citizens' urgent demands to tackle unemployment and economic chaos. Pushing the argument even further, the local political elite is unwilling to seriously tackle the economic emergency that has been dismantling the country's social texture. Endemic poverty, unemployment and widespread corruption provide a very effective weapon for citizens' discouragement, hopelessness and, ultimately, political apathy. The loud dissent expressed in February has turned into silent non-voting precisely because of this chronic lack of hope, reinforced by a political establishment, which finds its stability in this very mass de-mobilisation.Whether life after the elections resembles Christine Lagarde or an abandoned industry next to a new shopping mall, the picture for Bosnian citizens hardly looks encouraging.